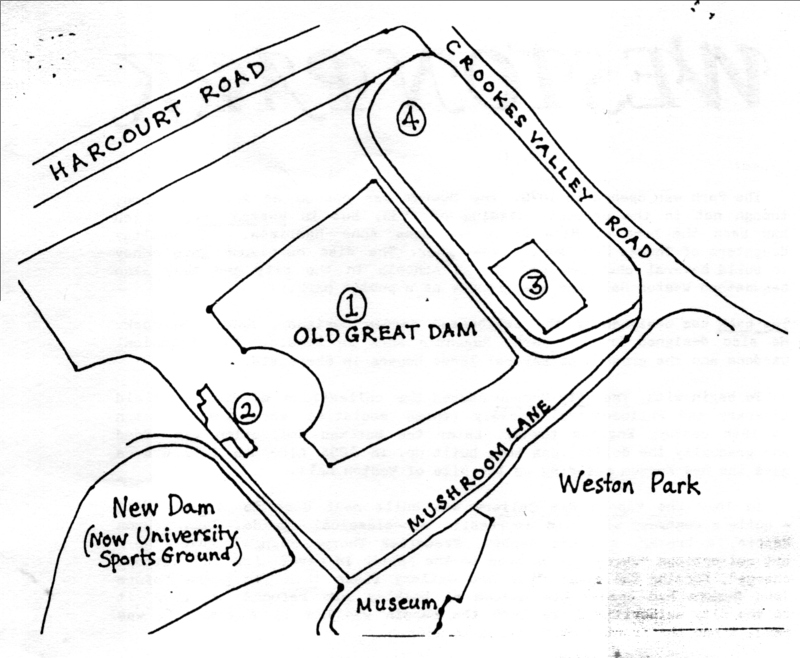 The Park was laid out early this century, following the construction of Crookes Valley Road. The central feature is The Old Great Dam, part of a string of ten lath century reservoirs stretching from Ralph’s Dam in Crookes to the smaller dams which lay north of lower Mushroom Lane (Ponderosa). These, with the Whitehouse Dams to the NE, were the first large reservoirs to supply the growing town of Sheffield with water, both for drinking and industry (including brewing). Most of them have now been filled in. Crookes Valley Road was built in la99, joining Winter Street and Barber Road. Before that people had to go by Western Bank or Addey St. to get to Crookesmoor. In l999 Trams were routed along the new road. The terraced area next to the road was-gradually built up. At a halfway stage a lower road was routed along the embankment, turning at the end into Harcourt Road; this can still be seen in the park. At the back of the Dam, emerging from the hillside, can be seen the early stone-arched culvert which still feeds water into the reservoir. Mushroom Lane, running between Weston Park and Crookes Valley Park, is much older than both. It runs from Mushroom Hall, the house on the corner opposite the Museum, to St. Stephen’s Church, Netherthorpe, connecting a densely populated area with the parks. The vicarage of St. Stephen’s used to be on the edge of Weston Park. 1) The Old Great Dam was built in 1785. During the 18th century Sheffield’s population grew from under ten thousand to nearly fifty thousand, doubling from c.1780 to 1810. It was thought at the time of building that The Old Great Dam, holding 21 million gallons, would hold enough water for all Sheffield’s future needs, but in fact it was soon too small. 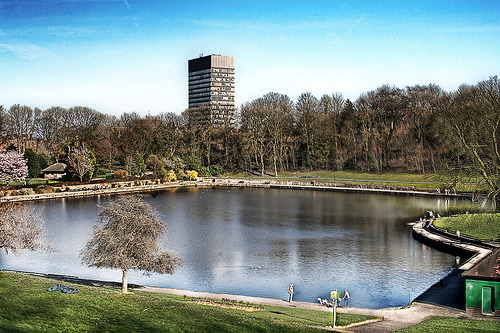 It became part of the Park and Recreation Ground earlier this century and was for many years a boating lake. 2) Dam House is by far the oldest building in the area. It was built in the 1780’s and appears in several older pictures, looking almost exactly as it does now. This is why it would have been tragic to have allowed the recently proposed development of the restaurant which would have greatly changed its appearance. It apparently started life as the Water Company Solicitor’s house; in the 19th century it was the home of the Hunter family (descendants of Joseph Hunter). It has been a restaurant for many years. 3) The Bowling Green was laid out soon after the Park opened, and has remained very popular. Recently the users took on some of the responsibility for its upkeep from the city recreation department. The burnt-out cabin has recently been rebuilt. 4) The Play Area was laid out about 30 years ago, on what used to be called the Recreation Ground. At present local people are looking after it and hopping to improve it.